Standard: Easy solution for sequentials. 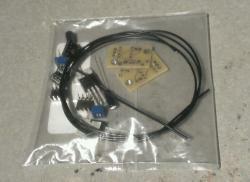 Includes two bulbs, two load resistors, and two T-taps. Easy installation. Not for use on tails that have been, or, will be converted to LED bulbs. DIY Versions: As seen on Camaro5.com, these are kits based on the thread. Adjustable delay. Note: Longer delays will require load resistors. The sealed box option can be used to protect the board from the weather. You will need to drill and seal three holes for the wires to pass through. Plug-n-Play: Preset to the slowest delay possible without triggering a Bulb-Out message on DIC. Also works on C6 Corvette! All of these will work on 2014-2015 non-RS Camaros except for the plug-n-play version. Great Product. Paid the extra $20 to have it built for me. Installed in under 5 minutes. Works great. No bulb errors.